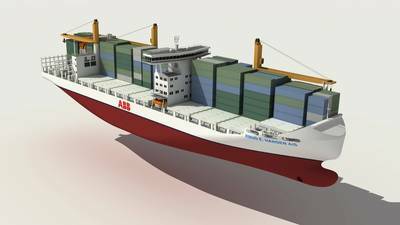 The Danish Naval Design and Marine Consultancy Knud E. Hansen A/S and joint venture partner ABB have developed a highly fuel efficient 2000 TEU Container Feeder Vessel. The vessel’s main dimensions have been optimised for calling in Bangkok, but the design features will deliver great benefits to operators and the environment on any route. The design delivers excellent fuel economy, reduced environmental impact, reduced need for water ballast, slow-steaming potential and flexible transit speeds, loading flexibility as well as increased container capacity including higher than usual reefer capacity. Propulsion efficiency is significantly boosted by an electrically driven counter rotating ABB Azipod unit, which is fitted behind the directly driven main propeller. The power balance between the main propeller and the Azipod is approximately 65/35 %, and as the Azipod can be turned 360 degrees, the vessel will have state of the art manoeuvrability, which reduces or eliminates the need for tug boat assistance in port. Compared to a vessel with a conventional diesel-direct propulsion system the main engine has been considerably down-sized, and with a correspondingly smaller propeller diameter in combination with a low shaft line, ballast water to submerge the propellers in light loaded conditions is generally not necessary. At 18 knots the main engine with its shaft generator will deliver the entire propulsion power including the electrical power for the Azipod unit, the hotel load and the reefer containers. Additional auxiliary power is only necessary if higher speeds (up to 21 knots) are required or if an exceptionally large number of reefer containers are carried. Three auxiliary engines with a total electrical power output of approximately 8000 kW are arranged in an auxiliary engine room, which is completely segregated from the main engine room. With the main engine stopped, the vessel is able to navigate with a speed of more than 13 knots on auxiliary power and the Azipod alone, which provides a very high degree of redundancy and more than sufficient “return to port” capability. The vessel features an ABB Onboard DC grid system that ensures engines will be run at their optimal load at any cruising speed from 2 to 21 knots, enhancing fuel economy and providing the option of highly flexible transit speeds, including slow steaming, which is not the case for the majority of feeder vessels of today. The vessel has an overall length of 172 m and a beam of 30 m. Deadweight at the Bangkok-max draught of 8.2 m is approximately 18,300 t, while it is approximately 28,400 t at the fully loaded draught of 10.5 m. The midship position of the narrow deckhouse provides a significantly better vision from the bridge and allows approximately 15 % more containers to be carried on deck than on conventional feeder vessels with the deckhouse located aft, while maintaining a crew comfort in bad weather, which is superior to designs with the deckhouse located forward. HFO tanks have been arranged in a simple, square block below the deckhouse in order to minimise the need for trim compensating ballast water and changes of trim during a voyage. Additionally, the tanks are segregated from the sides and the bottom in preparation for Clean Design Class notation. Space has also been prepared in the engine casing for scrubbers or a SCR system so that the vessel can be adapted for navigating in Emission Control Areas. The vessel is even prepared for zero-emission port calls, because containers holding batteries can be stored on the aft deck and connected to the DC grid. Five tiers of high-cube containers can be stacked in the holds and six on the hatches. In the gearless version the vessel will carry up to 1,448 TEU on deck and 668 TEU in the holds corresponding to a total high-cube capacity of 2,116 TEU. As designed, the reefer capacity below deck is 438 TEU (or 258 FEU), and with three tiers on the hatches and four on the aft deck the capacity on deck is 746 TEU (or 370 FEU), giving the vessel a total potential reefer capacity of 1184 TEU (or 628 FEU). But with 8000 kW of auxiliary power installed, access to the reefer units is practically the only limiting factor for the number of reefers that can be carried, so the capacity on deck may be further increased by higher lashing bridges aft and/or lashing bridges between the hatches. Maersk Broker is proud to have been a part of this very exciting project from an early stage, and we are very happy to take on the role as exclusive broker for this exciting new containership design. 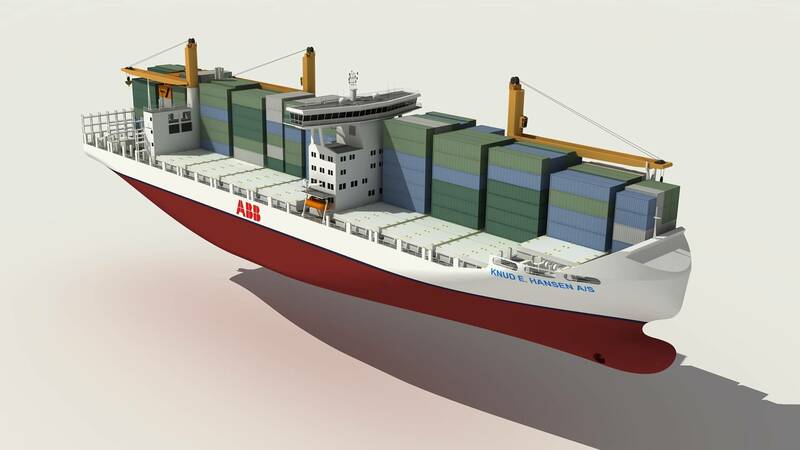 Compared to the many traditional designs on the market today, the development of this containership design has been characterized by real innovative “thinking outside the box”, which has produced some impressive results on both speed/consumption, stowage flexibility, and not least transit speed flexibility. We believe that this is what is needed in a future-proof design, and should be attractive to liner operators and tramp owners, who are focused on stowage/speed flexibility and fuel efficiency – and thus a greener profile. Propulsion efficiency is significantly boosted by an electrically driven counter rotating ABB Azipod unit.